'Tis the season to pray for love and peace all over the world. Such a prayer is inspiring, but it's hard to imagine loving the whole world. Maybe it is easier at Christmas to Pray Globally, but Love Specifically. I believe the only way to love the whole world is a person at a time. Once we love specifically, then we can extrapolate that, so it is wildly comprehensive. The work of loving the world has taken the community of Thistle Farms--a movement for survivors of trafficking and addiction--all over the globe for the past twenty years to specific women and communities. In each setting, we sit in a small circle with women survivors and listen and hold on to one another. Our first partnership was with 30 women farmers that survived the genocide in Rwanda. Then we began working with groups in more than 30 states, and 20 countries. Over and over, we fall in love with the individual women we meet as we engage their story and live into their hope. From those individual women and specific communities, we have learned about the universal issues of sexual assault, the violence and vulnerability of poverty and the common way women carry trauma. From loving women and communities we begin to see the exponential growth of love, and that made it feel possible to contemplate that we can truly love the whole world in way I'd never imagined before. Thistle Farms’ latest partnership took us to the Ritsona refugee camp in Greece this past summer. There we met a small group of women willing to venture into a new justice enterprise that weaves the life vests and blankets they escaped from Syria with into welcome mats. It was a humbling and hopeful week of watching new weavers bind hope into a pretty desolate place. 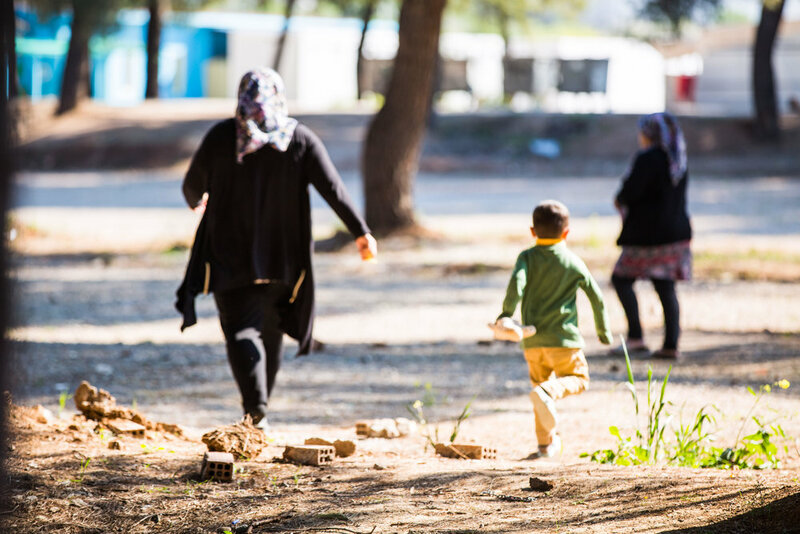 The Ritsona refugee camp is home to more than 1,000 refugees and while we were there the data indicated that 23 babies had been born in the camp the past year. The camp itself is an abandoned and dilapidated military compound with crumbling and peeling green walls over dusty dirt giant sunken area that serves as the center of the camp. There is dust everywhere inside the chain link camp surrounded by olive groves and grape vines. While the women in the new partnership began weaving, I spent hours wandering through the camp and trying to take in the massive trauma and weight of the collective story I was witnessing. The heaviness of the air felt thick with evaporated tears. You could witness deep relationships, funny moments and all kinds of creativity, as well. But, it was too much to try and understand the power of the wake of war in people wandering through the camp and lining up for every possible need they might encounter. They stood in lines for water, showers, a simple hammer or nail to fashion a bench out of discarded pallets, or diapers, and while they walked and stood with stoic patience there were glimpses of deep anger and grief. As we began our work on the second day, I noticed a young mother with an infant stroller walking along the perimeter. Her hair was covered by a blue scarf which resembles icons of Mary I remembered from youth. As I walked near her, I couldn’t see the tiny infant born in this camp as a refugee in the world, because his mother "Mary" had covered him in a thin, swaddling cloth, shielding him from all the dust and heartbreak. And, from an ancient place that women have been singing about since the song of Hannah in the book of Samuel, the words to "The Magnificat" rose in me. Watching the young mom and her infant, I marveled at her brave naiveté and wondered if she thought this swaddling cloth could shield her baby from the brokenness of this world, the violence of war, the horrors of politics, or the longing for home. But as the scene made its way from my eyes and into my heart where sight transforms into vision, I could see that this tiny veiled, innocent child is so wise and holy that he can teach us again about what it means to love the world. All of the sudden the enormity of the task of taking in the whole world of refugees, which can leave us overwhelmed, numb, confused, and scared, vanished as I just stood there like the shepherds hovering near Jesus’ manger and fell in love with the baby. I loved the wonder and mystery of him and loved everything about this gift wrapped like hope for the whole world. This baby, born in an occupied nation is a refugee-like Jesus fleeing to Egypt. This wonderful and life-giving child knows nothing yet but love from his mother, who like Mary was poor and powerless. Both of these women draped their child in bands of cloth and saw themselves as blessed by the child. This Christmas I want the image of that one baby in that one camp for that one moment to offer us the whole promise of peace and love at Christmas. Let yourself for a moment love that baby and by loving that baby, love his mom. And maybe for that moment, as we love the baby and his mom, we can love the people who love them. We can love the people who pulled the mom, great with child, off a boat, whose voyage was as treacherous as a donkey making its way to Bethlehem. We can love the doctor who like the innkeeper let them find shelter safe enough to deliver the child. Then maybe we can love all the people who cared for the doctors and rescuers and keep widening the love circle to the not-for-profits and people, who will love this mom and baby and care for them daily. Then we can keep following those concentric ripples until the world is within the circle. This baby shows us a way to love the whole world, which is Christ’s greatest longing for us. In the beginning was love, love as tender and vulnerable as a baby, and was enough for the whole world.